"No battle was ever won that was poorly planned. No plan ever succeeded that was poorly conceived"
In a country like India which have a coast line of 7417km and where majority of the trade is through sea, the importance of the navy is very important or that is what people think. But look at Indian Navy. In Indian Navy up to 60's all the major ships were purchased from other countries. In 70's there was an aircraft carrier, 2 cruises, 17 frigates and destroyer. In 80's 6 new ships came and 9 phased out. 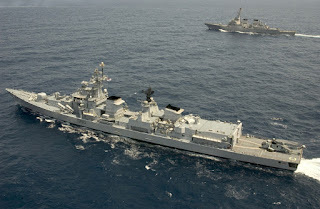 In 80's 5 destroyer from USSR and 3 frigates joined Indian Navy. total =8. (At the same time 8 gone - 5 due to age and 3 to coast guard). In 90's we have 4 frigates of 70's, 5 destroyers and 3 frigates of 80's, 3 destroyers and 3 frigates(indigenous) and 3 from USSR. total 21 destroyers/ frigates. If we consider the case of submarines; we dont have any till mid 60's, 4 in the end of 60's, it reached 8 in 70's. 8 more in 80's and 6 more in 90's. After scrapping some submarines navy operated a total of 18 in 90's.Now its only 14 submarines. The first 6 scorpene SSK submarines are expected to join the fleet in 2012 and the remaining 5 will follow at yearly intervals. Hope that project 75, project 76, Advanced Technology Vessel program all will go fine. But MDL shipyard will roll out no more than 1 frigate/destroyer in 18 months. Some new ships will join the nave in next decade but atleast a dozen will be phased out. Along with this we have to improve naval aviation too. CAG report of oct 2008, especially noted the poor naval fleet. The staggering notification is that no more than 48% of Indian submarine fleet is available for waging a war. Indian navy holds just 67% of force level envisaged in its 1985 plan. an some of the submaries are already outlived their service plan. It is not easy to build ships and put it in service quickly. But its the time where China is moving aggressively in naval front; they are building ports after ports in Myanmar, Srilanka, Pakistan etc. They are also planning to add many more ships to their fleet. The race for the control of Indian ocean is already on, but the main competetiors are US and China. Even the ocean is named after India, If we didnt move swiftly in naval front we may become just observers in the race between US and China for the control of Indian ocean. India's defence spending is only 2% of GDP; in China it is 7% and in Pakistan it is 5%. In the last year out of 7200 crore allocated to the navy only 4000 crore spent. Coast Guard too returned 200 crore back to the government out of their allotted 947 crore. Current budget allocation to coast guard is 1904 crore. Its high time to give a special focus on Navy. Political or any other delays should not come in the path of Naval expansion and modernisation. 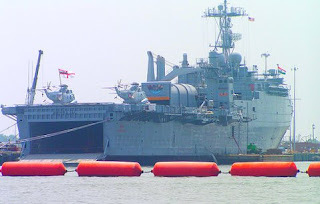 Othewise the plan to turn Indian navy to a blue water navy will remain in plan only.